The face in most of these paintings is that of Jane Burden Morris. Jane was the daughter of an English stableman and a housemaid, and grew up in poverty with very little education. Rossetti and fellow PreRaphaelite Burne-Jones "discovered" her while she was attending a theater performance. 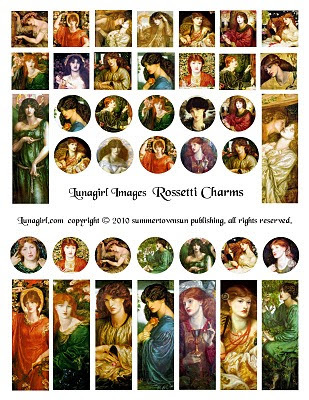 She was model and muse for Dante Gabriel Rossetti and William Morris (whom she married). After her engagement to William Morris, Jane obtained a private classical education and basically reinvented herself. She was highly intelligent, a voracious reader and accomplished student of languages and music, and moved with ease and grace among artists, philosophers, political activists, and the upper classes. She and Morris lived an artistic, bohemian lifestyle at Kelmscott Manor in the Cotswolds. 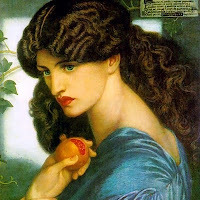 She may have been Rossetti's lover as well.